Today I wanted to introduce our readers to the different methods of managing your small business IT infrastructure. For the purpose of comparison, we look at three different options in which you can manage your IT infrastructure- manage it yourself (Self-managed), manage through an IT support vendor charging you on a “Time and Material” basis or you can rely on an outsourced IT support contract. This post discusses various facts related to achievable real IT expense savings and soft ROI benefits for each option. For illustration purposes, I considered a case study of a typical small or medium business having 40 user desktops, three servers (one Mail server, one Line-of-Business server and one File/print server), one firewall, one router, two LAN switches and one network printer. Here is a detailed analysis of the options available to you based on industry standard cost models. Consider a case in which you decide to manage your IT network by hiring your own full-time staff which comprise a network or IT administrator. Around Philadelphia that will cost you between $60,000 and $70,000 depending on your location and the employees experience. For this illustration, we will fix this cost at an average of $65,000. Additional costs for staff including benefits, sick and vacation leaves plus 7.5% payroll tax is about $18,850, so your first fully burdened IT employee will cost $83,850 a year. Furthermore, you will need to purchase IT management system and required hardware; we assume its one-time cost $10,000. You staff training on the management software would cost you $2,500 more. In sum, you end up spending $83,850 per year and approximately $10,000 as a onetime expense. Suppose you decide on a third-party vendor to manage your IT infrastructure on a Time & Material basis. They would charge you approximately $165 per hour with an average minimum call time of 2.0 hour per call and $75 towards travel charges. Assuming one call logged per server per month, a total of eight calls for workstations per month and an additional two calls per month to attend to problems related to Fire-wall, Switches and Network Printers. 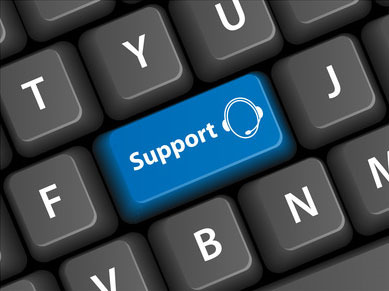 You end up spending $5,265 per month or $63,180 per year on this IT support approach. In this model, on an average 40% of the IT issues are managed by the vendor, the balance being handled by end users themselves. Plus remember, this approach is completely reactive, you don’t dispatch until something is broken, so total time to repair can become problematic. It’s less that doing IT yourself, but you do place a burden upon your employees to help support their own IT. Outsourcing your IT services would include proactive monitoring and management of your servers and workstations and IT infrastructure equipment. It carries out preventive maintenance on the servers as well as your workstations along with maintaining network devices for optimal performance. All the work is done on a proactive basis, (the outsourcer does not wait for something to break.) Your end-users would call a toll-free number to inform the IT service provider of their day-to-day operational issues, which would be logged and resolved by an expert help-desk staff. A Turnkey approach like this typically comes with a periodic visit from a Virtual CIO or an IT professional that holds an MBA and can sit down with you and your business leaders to discuss IT projects, business impacts and review the contracted work that has taken place. Annual budgets can be developed and IT can be viewed as a strategic business advancing opportunity versus a necessary cost. A Turnkey IT approach like this would typically cost $95 per month per Workstation, $295 per month per Server, and $180 per month for network devices, bringing the total cost per to $5,585 per month or $67,020 per year. Time and Materials is the least expensive approach, and certainly the classical approach of a small business for their IT support. This approach eliminates the headache and expense of hiring a fulltime IT employee, training them and purchasing a management system. But T&M is a reactive management approach; there is no 24 hour 365 day a year monitoring and management of the IT infrastructure. You are paying T&M on systems that are “down,” and not operational. Often you are delayed in getting support because there is a physical travel component to the process, and you are completely dependent on a third party. Plus remember your employees are shouldering most of the IT work themselves which keeps them away from the work you hired them to accomplish! Outsourcing your IT in a completely turnkey approach is less expensive than doing it yourself. Yes, you are dependent on the service provider (ANP has been doing this since 1984) but it’s important you find a provider that can give you a written performance guarantee or you money back! Once the provider has some skin in the game you can lessen your risk in depending solely on a third party for your company’s support. This is not the least expensive solution, but it is much less expensive than doing IT yourself. You get the benefits of 24 hour 365 days a year proactively monitoring the IT infrastructure. Your support is most likely being provided by a team of experts rather than one employee so you are no longer single threaded. Your workstations, servers and infrastructure equipment and software will be comprehensively managed to best practice levels. System reporting, availability reports, and an Enterprise class IT systems management toolset and best practices will be applied in a highly automated process. Plus the access to a Virtual CIO as needed completely rounds out an IT solution that your small business could not afford if you had to staff it yourself. Would you like to learn more? Cilck on the button below to see how outsourcing your IT could enable your company to enjoy a more predictable IT solution less expensively than doing IT yourself.